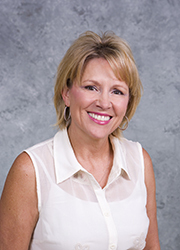 Tammy Hebert has been at Lamar since 2004, and has been executive assistant to the dean of the College of Fine Arts and Communication since 2008. She holds a general secretary associate's degree from Lamar State College - Port Arthur. Ms. Hebert has more than 30 years administrative experience. She worked for her family business prior to coming to Lamar. Ms. Hebert enjoys assisting students and staff at Lamar, and her favorite past-time is spending time with her family and especially her two young grandsons.